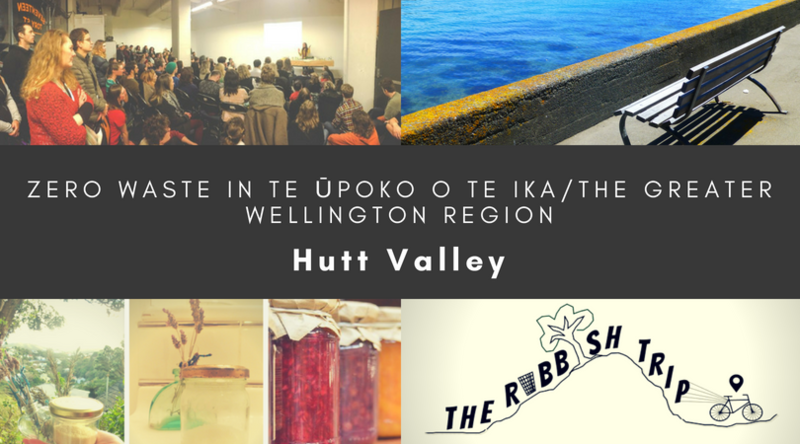 This guide covers Hutt Valley only. For other parts of the Greater Wellington Region, please refer to the Zero Waste in the Greater Wellington Region homepage. Bin Inn Lower Hutt, 211 Jackson St, Petone – offers a wide array of dried food in bulk (including, but not limited to, nuts, seeds, cereals, grains, flours, and legumes), a range of spices, liquid foods (including vinegars, oils, chutneys, sauces and syrups), and sweets and treats. They also have a peanut butter machine. All Bin Inn around New Zealand stores are currently offering 5% discount when you bring your own containers! Yogiji’s Food Mart, 56 Hutt Road, Petone – stocks a wide array of dried pantry staples in bulk bins, including, but not limited to, nuts, seeds, grains, legumes, flours, spices and condiments. Just BYO bags! Commonsense Organics, 37 Waterloo Rd, Lower Hutt – offers a wide array of dried food in bulk (including, but not limited to, nuts, seeds, cereals, grains, flours, and legumes), liquid foods (including vinegars, oils and tamari). Common Grocer at Common Unity Project Aotearoa, 310 Waiwhetu Road, Epuni, Lower Hutt – this is a community bulk store open to members who sign up and it is definitely worth signing up because the prices are AMAZING!! Very affordable. No single use plastic bags are available and members are encouraged to BYO bags/containers. The store stocks a range of dried food in bulk, including grains, flours, legumes/pulses, dried fruit, nuts, seeds, herbs and spices. They also stock liquid foods like oil and vinegars. There are various annual “payment” options for membership: paying $1 each time you use the shop and 2 hours per month volunteering at the grocer; $52 upfront and 1 hour per month volunteering at the grocer; or $100 upfront and no time commitment. Members of the grocer can also take part in workshops about how to cook from scratch using the ingredients at the grocer, and make things like natural cleaning products! Finz, Queens Arcade, 67-69 Queens Drive, Lower Hutt – BYO bags and containers to get beautiful hazelnut products unpackaged. You may need to call in in advance for certain items so that they can be put in your bags at time of packaging. Also sell hazelnut milk in glass bottles which you can return to the store for reuse! Supermarkets – most supermarkets have bulk bin/pick and mix sections with wholefoods (BYO bags for these). However they’re pretty expensive, often more so than equivalent ingredients in packets (bah! ), and more so than the bulk bins at places like Bin Inn or Commonsense Organics. But look out for when things in the bulk bin aisle in supermarkets are on special because sometimes you can get a good deal! The Dutch Shop, 89 Jackson St, Petone – BYO containers to get unpackaged cheese cut off the wheel, and unpackaged cured meats. Ontrays, 38 Fitzherbert St, Petone – BYO containers to fill up unpackaged goodies at the deli, including cheese and cured meats. La Bella Italia, 10 Nevis St, Petone – great deli food, including cheese and cured meats – BYO containers to fill up! Hardy Street Quality Meats, 15 Hardy Street, Waterloo – good range, will tare container. Park Avenue Continental Meats, 829 High Street, Epuni – huge range of european style meat, sausages, small goods and other meat products. Also have wheels of gouda cheese you can have sliced into your own container. Unpackaged live mussels – there are a few stores around town that stock unpackaged live mussels at self-serve counters. We put them straight into upcycled ice cream containers/BYO containers rather than the plastic bags the stores usually provide. You can find unpackaged live mussels at Pak’NSave Petone, Jackson Street, Pak’NSave Lower Hutt, High Street, New World Hutt City, Bloomfield Terrace, Wellington Seamarket, 87 High Street, Lower Hutt, New World Silverstream and Pak’NSave Upper Hutt. Try your luck with BYO containers at the supermarket delis – Most supermarkets have a deli section offering meat, seafood, olives and other antipasti, salads, lunch foods and more – all unpackaged. Some supermarkets will allow you to BYO container for these goods, while others won’t. It can be hit and miss, often depending on the staff member you talk to. For example, New World and PAK’nSAVE supermarkets have a flexible franchise model which means they can usually make their own in store decisions about whether to allow BYO containers or not, whereas pretty much any Countdown will not accept BYO containers. It’s always worth asking though! PAK’NSave Petone, 114-124 Jackson Street, Petone has a large deli section, including wheels of cheese. Daily Bakery, 457 High Street, Lower Hutt – ask to have without paper bags and BYO! Fuda Bakery, corner Waiwhetu Road and Porutu Street, Epuni – ask about getting loaves of bread unpackaged. Bun Heng Bakery, 585 Fergusson Drive, Upper Hutt – loaves are usually put in plastic, so ask if you can get them unpackaged. Markets – No two ways about it, if you want to get a good source of unpackaged, often locally grown, produce, markets are the place to frequent! By and large, we’ve found that markets, where you can meet the grower/producer face-to-face, are really great for starting fruitful conversations about waste-free food, and developing relationships and systems that enable you to get your favourite fruit, vege and preserves without the packaging. Many of the Wellington markets have local producers of pre-made foods like tofu, noodles, preserves etc. Have a chat to see if you can leave containers with the stall holders for them to fill with your desired product for you to pick up from them the following week, or if the stallholder uses glass jars for packaging, ask whether they will take their empty glass jars back for sterilisation and reuse. BYO bags and containers to markets such as the Riverbank Market Lower Hutt, Riverbank Car Park off Rutherford and Daly Streets, Saturday 6am-2pm. Trade Aid – Trade Aid‘s entire chocolate range comes in Econic home compostable packaging! Their 2kg sugar bags are also great for upcycling as bulk bin bags, and are home compostable also. Trade Aid’s coconut oil is one of the few on the market that does not have a plastic seal around the lid. You can get all these products at Trade Aid Petone, 125 Jackson St, Petone, as well as Commonsense Organics, 37 Waterloo Road, Lower Hutt. PAK’NSave Petone, 114-124 Jackson Street, Petone stocks the chocolate and sugar. New World Silverstream stocks Trade Aid chocolate. Ekko Naturals, Upper Hutt stocks Trade Aid (and Loving Earth) chocolate. The Chocolate Story, 185 Jackson Street, Petone – artisan chocolates and truffles unpackaged – BYO containers to put them in. The Dutch Shop, 89 Jackson St, Petone – lots of sweets and licorice unpackaged in bulk bins – BYO containers/bags! Village Beads, 129 Jackson Street, Petone – unpackaged fudge – BYO container to have it put in. Other pre-made food in home compostable packaging – Loving Earth chocolate comes in home compostable packaging and you can find it at CommonsenseOrganics, 37 Waterloo Road, Lower Hutt and Bin Inn Lower Hutt, 211 Jackson St, Petone. Ceres Organics raw goodness bars come in Econic home compostable packaging and you can purchase these at Commonsense Organics, 37 Waterloo Road, Lower Hutt. Coffee – wherever possible, we encourage people to find places that sell whole or ground coffee beans unpackaged and have them put in BYO bags/containers. Coffee roasters are a great place to start. At both Good Fortune Coffee Co, 160 The Esplanade, Petone and Ripe Coffee, 22 Waione Street, Petone you can have freshly roasted beans put straight into a BYO bag/container. At Mo Town Cafe, 121 Randwick Road, Moera you can get Ripe Coffee’s Pito-One blend of beans unpackaged (the other blends are all pre-packed). Otherwise, PAK’NSave Petone, 114-124 Jackson Street, Petone, New World Hutt City, Bloomfield Terrace, and Bin Inn Lower Hutt, 211 Jackson St, Petone stock Screaming Turtle (and Caffe L’affare at New World) coffee beans in bulk bins which you can put directly into your own bags/containers. If you prefer instant coffee, go for Trade Aid‘s instant coffee because it comes in home compostable packaging. Find it at Trade Aid in Petone or Commonsense Organics in Lower Hutt, and Ekko Naturals, Shop 6, City Arcade, 123 Main Street, Upper Hutt. Tea – most tea bags have plastic in them, so we encourage people to drink loose leaf teas. We’re always on the lookout for loose leaf teas that you can get unpackaged. You can get unpackaged loose leaf tea put straight into BYO containers from the t leaf T factory at 64 Victoria Street, Petone. You can also get black tea in bulk at Bin Inn Lower Hutt, 211 Jackson St, Petone. Milk – Wellington region finally has a glass refill system for milk! This is available through Eketahuna Country Meats at the Riverbank Market on Saturdays – just BYO glass bottle or purchase one for $3 and return every week for a refill on site. They also sell their milk at the Habourside market in Wellington City, or at their shop in Masterton. Otherwise, you could look into MannaMilk, which is a raw milk company delivering raw milk all across the Lower North Island, including drop-off points throughout the Hutt Valley. The milk is delivered in single-use plastic bottles, which isn’t zero waste. HOWEVER, you can request that the milk be dropped-off in a reusable 10L pail, which you can pour into BYO bottles. As this is a large quantity of milk, you can either get a lot and freeze some, or go in with a group of others and share the milk and the cost between you. You can see MannaMilk’s delivery routes, days and drop-off points here. Beer – Get craft beer on tap filled into your own bottles or flagons at Liquor King Petone, 63-69 Jackson Street, Petone; Sprig and Fern Tavern, 146 Jackson Street, Petone; Queen of Jackson, 181 Jackson Street, Petone; Liquorland Waterloo, 2 Trafalgar Square, Waterloo, Lower Hutt and Liquorland Upper Hutt, 767 Fergusson Drive, Elderslea, Upper Hutt. Alternatively, go straight to the brewery to fill up your bottles – there are local breweries in the Hutt Valley, including the wonderful Kereru! For other options, check out this fabulous list. Drinking Chocolate – your best bet is to go to any Commonsense Organics, 37 Waterloo Rd, Lower Hutt store and get Kokako drinking chocolate which comes in Econic home compostable packaging. Bin Inn Lower Hutt, 211 Jackson Street, Petone, and the Common Grocer, 310 Waiwhetu Road, Fairfield, Lower Hutt, also stock cocoa powder in bulk. Get the NZ-made Cuppa Coffee Cup at NZique, 154-164 Jackson Street, Petone, Espresso Cafe, Silverstream, Ekko Naturals, Upper Hutt. You can get Joco Cups at Fellow Cafe, 60 Queens Drive, Lower Hutt, the Little Theatre Cafe, 2 Queens Drive, Lower Hutt, Ekko Naturals, Shop 6, City Arcade, 123 Main Street, Upper Hutt (also stocks Sol cups, similar to Joco), Created, 133 Main Street, Upper Hutt. Reusable lunch boxes or containers are great to have on you when you’re out and about in case you want to get takeaways, to carry leftovers home with you, or if you find food to forage. You can get Meals in Steel stainless steel lunchboxes and food containers at Commonsense Organics, 37 Waterloo Rd, Lower Hutt. Plastic shopping bags are a menace, but so too are those plastic produce bags for fruit and vege or the plastic bags often offered alongside bulk bins at bulk stores. You can avoid them by bringing your own bags or buying a set of reusable produce bags. You can get 100% organic cotton Rethink produce and bulk bin bags at Commonsense Organics, 37 Waterloo Road, Lower Hutt. The incredible Common Unity Project Aotearoa, 310 Waiwhetu Road, Epuni, Lower Hutt sells locally made reusable shopping bags and bulk and produce bags, all made from repurposed fabrics. House of Knives, 171 Jackson Street, Petone sells 100% cotton string bags. Ekko Naturals, Shop 6, City Arcade, 123 Main Street, Upper Hutt stocks a range of reusable carry and produce bags. Reusable sandwich bags – you can get Munch reusable sandwich bags and/or wraps from Commonsense Organics, 37 Waterloo Road, Lower Hutt. Or, get local Hutt Valley made reusable lunch pouches and sandwich wraps made from repurposed fabrics from Common Unity Project Aotearoa, 310 Waiwhetu Road, Epuni, Lower Hutt. Ekko Naturals, Shop 6, City Arcade, 123 Main Street, Upper Hutt stocks Pip Pottage lunch bags and a range of Munch lunch pockets/wraps. You can find dishbrushes with wooden handles and removable + replaceable, home compostable heads at Commonsense Organics, 37 Waterloo Road, Lower Hutt and Belle La Vie, 265 Waiwhetu Road, Epuni (Dishy). Alternatively, you can get Go Bamboo veggie brushes at Bin Inn Lower Hutt, 211 Jackson St, Petone, which can also be used as dishbrushes (just without a handle) and which are also totally home compostable, should they ever wear out. For something more like a traditional dishcloth sponge, check out the SPRUCE or Wet-it! 100% cotton + cellulose dishcloth sponges (home compostable at the end of their life) which are available at Commonsense Organics, 37 Waterloo Road, Lower Hutt, Belle La Vie, 265 Waiwhetu Road, Epuni, Ekko Naturals, Shop 6, City Arcade, 123 Main Street, Upper Hutt. If you’re after a coarser scrubby, you can get 100% coconut fibre coarse scrubby from Commonsense Organics, 37 Waterloo Road, Lower Hutt. Belle La Vie also stocks a 100% Rayon dishcloth. You can get 100% Cotton dishcloths at The Dutch Shop, 89 Jackson St, Petone and Ekko Naturals, Shop 6, City Arcade, 123 Main Street, Upper Hutt. Commonsense Organics, 37 Waterloo Rd, Lower Hutt – stocks a range of liquid cleaning products you can fill your own bottles with. Bin Inn Lower Hutt, 125 Jackson St, Petone – stocks a wide range of both liquid and powdered cleaning products/ingredients you can fill your own bottles and containers with. They also stock SoapNuts NZ laundry soapnuts (which come in a compostable cardboard box with no plastic inner lining! ), and baking soda and white vinegar in bulk (both essential for homemade cleaning products). Knit World, 62 Queens Drive, Lower Hutt stocks unpackaged bars of Castile soap, which can be used as a base for homemade cleaning products (see how it works here). Vibrant Health, 153 Jackson Street, Petone – stocks bars of Dr Bronner’s Castile soap, which can be used as a base for homemade cleaning products. Ekko Naturals, Shop 6, City Arcade, 123 Main Street, Upper Hutt – stocks unpackaged Soapberries (a home compostable nut/seed alternative to laundry powder) in bulk bins. Bamboo toothbrushes – a great alternative to plastic toothbrushes because they have wooden, home compostable handles (though bristles are still plastic and need to be removed from the handle and put in a rubbish bin). You can find bamboo toothbrushes at Commonsense Organics, 37 Waterloo Road, Lower Hutt; Pak’NSave Hutt City, Brunswick Street; Vibrant Health, 153 Jackson Street, Petone; Bin Inn Lower Hutt, 211 Jackson St, Petone, Silverstream Pharmacy (Grin bamboo), New World Silverstream (Grin bamboo), and Ekko Naturals, Shop 6, City Arcade, 123 Main Street, Upper Hutt. Dental Floss – Commonsense Organics, 37 Waterloo Road, Lower Hutt stocks Do Gooder floss, which comes in a refillable glass tube with a screw on metal lid. The WHITE floss is made of 100% silk and is home compostable (the black floss has polyester in it so is landfill only). When you run out of the floss, no need to get a new dispenser, you can get refills of the floss in a paper bag from all stockists listed above – just pop the refill into your original metal/glass dispenser. Ekko Naturals, Shop 6, City Arcade, 123 Main Street, Upper Hutt stocks Dental Lace 100% silk floss which also comes in a glass dispenser with metal lid (refills are in plastic, though). Commonsense Organics, 37 Waterloo Rd, Lower Hutt. Vibrant Health, 153 Jackson Street, Petone – unpackaged bars made by Dragonfly Natural Soap Co.
Bin Inn Lower Hutt, 211 Jackson St, Petone. NZique, 145-164 Jackson Street, Petone. NZique, 154-164 Jackson Street, Petone stocks shaving bars and shampoo bars by Clutha company Simple Naked Soap. Also stocks the 3-in-1 shaving, shampoo and body wash beer soap bars by Nelson company Global Soap (though unfortunately this bar is plastic wrapped). Ekko Naturals, Shop 6, City Arcade, 123 Main Street, Upper Hutt – Dindi Naturals shave, beard and shampoo soap bars, and also stocks Bee Fresh deodorant in compostable cardboard. Avoid plastic shavers that are designed to be disposable and go for 100% metal razors that will last you decades and only require the 100% metal and recyclable blades to be replaced (or sharpened with a leather strop! ), and remember to use a bar of shaving soap instead of shaving foam that comes in an aerosol can (see above) – note, you’ll need a shaving brush to make this work. You can buy razors and replacement blades from Dirtbag Barbers, 4 Margaret Street, Lower Hutt. You can get shaving brushes from Commonsense Organics, 37 Waterloo Road, Lower Hutt, and Avisons, 110 Main Street, Upper Hutt. Cotton Buds – Go Bamboo makes home compostable buds so you can avoid the single-use, unrecyclable plastic ones. Get them from Commonsense Organics, 37 Waterloo Road, Lower Hutt. You can get unpackaged beeswax from Commonsense Organics, 37 Waterloo Road, Lower Hutt and Ekko Naturals, Shop 6, City Arcade, 123 Main Street, Upper Hutt. Baking Soda is an essential ingredient in lots of homemade toiletries such as toothpaste and deodorant, as well as just a great general cleaner when teamed up with vinegar. You can get it unpackaged in bulk from Bin Inn Lower Hutt, 211 Jackson St, Petone, Yogiji’s Food Mart, 56 Hutt Road, Petone, and Ekko Naturals, Shop 6, City Arcade, 123 Main Street, Upper Hutt. You can get a whole range of DIY toiletries ingredients in bulk bins from Ekko Naturals, Shop 6, City Arcade, 123 Main Street, Upper Hutt (including arrowroot, critic acid, soda ash, epsom salts and baking soda). We’ve heard through the grapevine that Aromasense, 185 Jackson Street, Petone will do refills of essential oils into BYO little bottles.